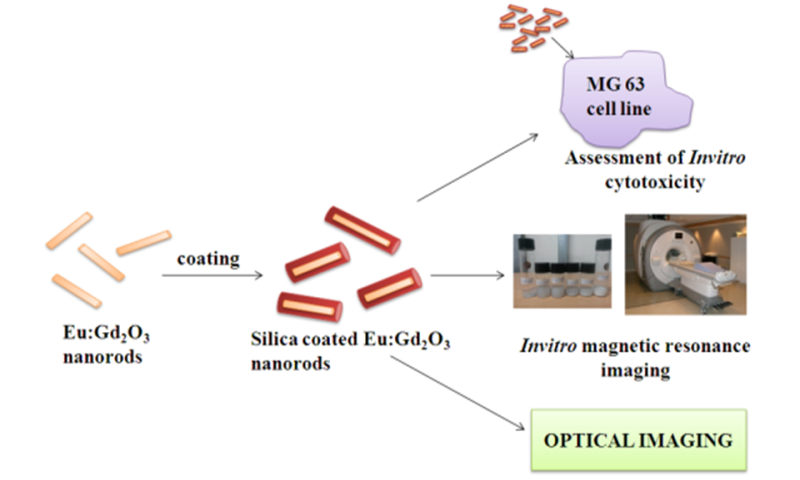 Researchers from PSG College of Technology, India have developed nano-contrast agents for magnetic resonance imaging (MRI) as well as optical imaging of cancer cells. This report will appear in the forthcoming issue of the journal NANO. Cancer identification at the early stage remains a challenge to the researchers and clinicians. To diagnose the cancer cells, various imaging modalities are being used. Among these modalities, MRI and optical imaging are combined to develop dual modal imaging. Europium doped gadolinium oxide nanorods were synthesized by co-precipitation technique. Inorder to improve the biocompatibility, the nanoparticles were coated with silica. The invitro cytotoxicity results shows that the developed contrasts are not toxic at the lower concentrations. Invitro MR images reveals that the bright contrasts are produced when the concentration is increased. According to Dr. R. Arun Kumar, Associate Professor, PSG College of Technology, "The developed nano-contrast serves for both MRI and optical imaging. Therefore, the imaging of cancer with higher sensitivity and spatial resolution is possible. The mortality rate can also be reduced." One of the authors (Ms. T. Gayathri) is grateful to TEQIP for providing financial assistance. Further research on the optimization of the size, concentration and morphology of the nanorods are being carried out for better results. Additional co-authors of the paper are T. Gayathri from PSG College of Technology, B. S. Panigrahi from Indira Gandhi Centre for Atomic Research, Kalpakkam and B. Devanand from PSG Hospitals.